Register Here: Count me In! Bunny Wonderland will be hosting an interactive workshop for prospective and new rabbit owners to learn about basic rabbit care. 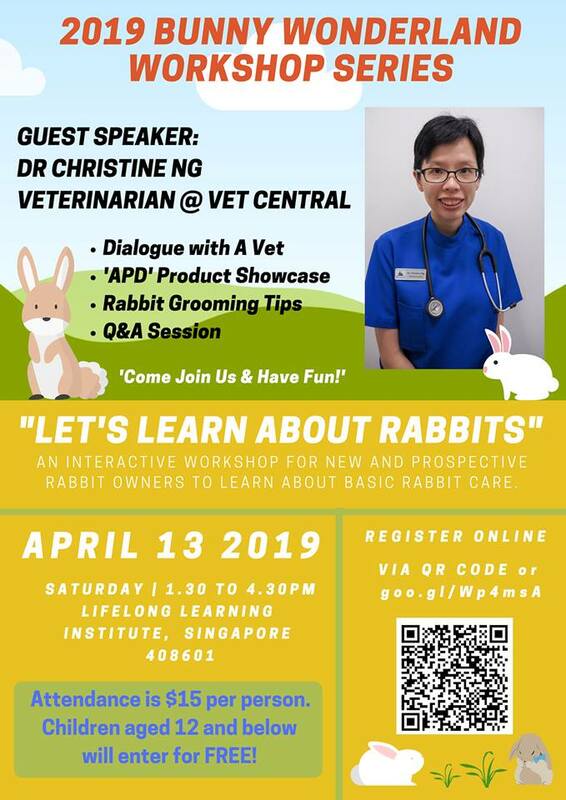 We are honored to have Dr. Christine Ng from Vet Central as our guest speaker for this event. Dr. Christine started her veterinary career in the United States and has been practicing in Singapore since 2012. Her keen interest in small animal exotic medicine makes her a very well-loved vet amongst many rabbit owners! In addition, our trusted rabbit care professionals from briopets will be there to showcase American Pet Diner(APD) products. Ms. Clarris Ang of My Happy Tales will also be there to share grooming tips to help new and prospective owners learn more about up-keeping their pets! Last but not least, our Bunny Wonderland volunteers will be there to share their experience and answer any questions you may have about rabbit care. If you would like to attend this workshop, please register now. Seats are limited!